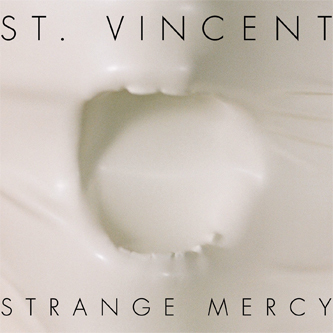 Coming across like a weird hybrid of Dirty Projectors, Tom Waits and Susanna and the Magical Orchestra (really), ‘Strange Mercy’ is the third full-length from St. Vincent (aka Annie Clark). It certainly wasn’t what I was expecting either, with the critical (and most likely commercial, although I don’t have numbers in hand…) success of ‘Actor’, I wrongly assumed that Clark would ditch all her avant leanings in favour of some kind of post-Feist Levis fest, and that’s not even close to what we have on ‘Strange Mercy’. Rather Clark has honed her songwriting skills and allowed her imagination to run wild on the production – angular guitars, fuzzy leads and deliriously odd rhythms are tossed around throughout the record yet never sound forced or shoehorned in. This isn’t the ‘necessary’ scene-pleasing weirdness many artists pine for, nor is it the concessionary record it so easily could have been. It’s a rare beast; a truly listenable, expertly constructed, proper avant pop album. Not a collection of MP3s, not a single YouTube hit and a bunch of filler – a real album. It almost makes me a little nostalgic, and with ‘hits’ like ‘Cheerleader’ and ‘Cruel’ nustling up against the weirder, more poignant jams she might even get ‘the kids’ on her case too. Recommended.